to the FAA, the average age of a general aviation airplane is about 35 years old. Depending on who you ask, that’s really old! Or young! Believe it or not, the majority of those metal birds flying out there are kept in really good shape thanks to thorough annual inspections, paint jobs, interior refurbishments, avionics upgrades, and of course, lots of TLC. Ownership pride is one of the reasons why “old” airplanes are still around. However, no matter what kind of shape your airplane is in there has been a recent revolution in general aviation thanks to the advent of the iPad and other similar tablets. Through the use of Electronic Flight Bag (EFB) software like ForeFlight, Garmin Pilot, or similar application, pilots now can fly without having to perpetually purchase navigation charts. Not only that, these apps let you know exactly where you are and even incorporate ADS-B traffic and weather information when you pair it with a compatible device like a Straux, Stratus, Scout, or compliant ADS-B transponders. With tablets being as seemingly pervasive as they are, it’s no doubt that just about every pilot I know has one and loves their EFB app of choice. Regardless of the brand of application, one thing we can agree on is that the added situational awareness is a real benefit to GA pilots. But one discussion still persists. This one question is almost as divisive as asking for someone’s political affiliation, whether they prefer Coke or Pepsi, whether they like track up or North up, or whether they like Apple or Android. How do you mount your tablet in the cockpit? When asked in a group, you’ll get two sides to this argument. There are the windshield mounters and the yoke mounters. Please pay attention to the size of the holder. These fit a standard 7-inch (or “mini”) devices. If you have a bigger tablet you’ll need to look for a proper adapter or kit to fit your needs. Here is an overview and a brief description of the pro’s and con’s of each. This is the almost instinctual answer when you start thinking about the problem. When you first have your tablet and have it on your lap, you find yourself looking down and fumbling with the tablet at odd times because it slides around your lap a little bit. You think to yourself “hey, I’ll just mount it on the yoke then it’ll always be right there in front of me when I need it”. So you go out and procure the parts and mount your ipad, then discover the con’s. Cons: In my opinion, the biggest downside to a yoke mounted ipad is the movement. When you move the yoke, the tablet also moves around! Whether you are turning, climbing, or descending, the iPad isn’t always in the same spot, nevermind the same orientation. It is terribly inconvenient to look down at your chart only to see that it’s rotated and your information is displaying in a different way than it was just doing. Yes you can bypass that by turning on the rotation lock on your device however, the fact remains that sometimes in a turn you still need to look at things and you end up having to turn your head and risk becoming disoriented. Another drawback is the potentioal for interfering with flying. Depending on your size, when you have your tablet mounted on the yoke it sometimes hits your leg as you pull back or turn the yoke, which could be dangerous if you need full deflection of the flight surfaces but aren’t able to do it because your ipad is impeding your movement. In spite of those things, mounting the iPad on the flight yoke is still a nice thing to do, especially if you’re able to get it to mount without interfering with your control inputs. But, if you’d like to avoid any of those downsides, consider the windshield mount! The windshield mount is my preferred way to mount the ipad in the cockpit. The only part of the kit you have to substitute is the actual ‘clamp’ part for a suction cup. You can still use the same arm and tablet holder. The windshield mounted ipad is really nice because it’s always there and doesn’t really interfere with any of your flight instruments. I’ve tried it in a couple of different airplanes like an Arrow, Tomahawk, and Cessna 172 all without issue but you may find that you need to play with its location a few times before you find the spot that’s “just right” for you. 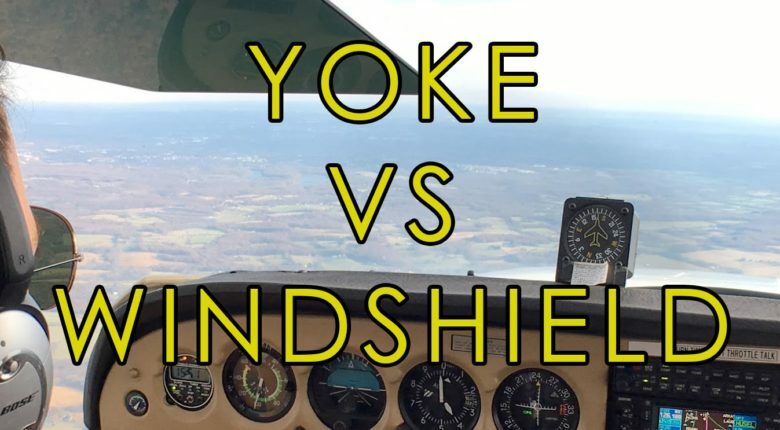 The only thing to really watch out for is to make sure that you have a clean windshield and get good suction when you mount it, otherwise it could potentially fall off during flight so push it in hard and twist the air lock to ensure a tight seal! Now that you have your iPad mounted on the windshield, it becomes really convenient to plug it in to a power source to make sure that you don’t run out of power. Just take your usb cable and plug it in to an external USB battery tucked away in the map pocket by your knee and you’ll have a long lasting battery. I personally use a Ravpower battery like this one. I’ve had it for a couple of years and it lasts forever. I estimate that it can probably keep an ipad fully charged for a solid 8 hours before it gives out, then you have the entire battery of your ipad to keep you going but chances are you’ll land the plane way before the battery quits. Check out my review of the Ravpower USB battery for more details.